Engines get hot. Engines get so hot that they can cause essential parts of your car to melt, warp, crack, and even catch on fire. Radiators keep engines cool so that they don't break, and just like every other part of your car, radiators need maintenance to work properly. If you notice steam coming out from under your hood, or if your heat gauge is in the red, then you've got yourself a big problem. The first thing you should do is let your car cool down. The next thing you should do is visit your trusted local radiator shop. This isn't the sort of problem that goes away by itself, and engine repair or replacement is significantly more expensive than radiator service. Count on Cartech Automotive & Transmission Repair when you need radiator repair in San Antonio, TX. Our service is backed by more than 30 years of experience and all of our work is guaranteed. You're assured great service, parts, and value. Radiators are filled with fluids to help keep the engine cool. As time progresses and as you use your vehicle, that fluid accumulates dirt, rust, and other debris that clogs the pump, preventing the proper flow of coolant. When this happens, the radiator isn't able to cool the engine, and then the real problems start. Other issues such as cracks in the radiator tank or hoses could also be the source of the problem, as all the coolant would drain from the vehicle. Fortunately for drivers, these issues are simple to resolve for experienced mechanics. 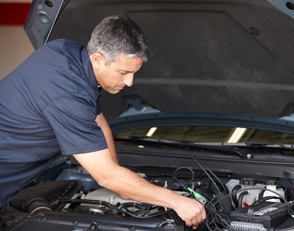 A radiator flush and fluid refill could be all you need to maintain proper engine temperature. Cracks in the hose or fluid tank can sometimes be patched up good as new. When the cracks are too severe, radiator replacement is relatively inexpensive and an easy fix for a pro. Trust our pros for quality workmanship and great customer service when you need car radiator repair or any of our other auto services. We'll provide you with honest and objectively sound advice in regards to the best way to resolve your auto troubles. Your safety is important to us, which is why we're committed to using high-quality parts in our shop. Count on us to help you maximize the performance and longevity of your vehicle. Contact us to schedule an appointment for radiator service. We proudly serve San Antonio, Texas, and the surrounding area, including Helotes, Leon Valley, Pipe Creek, and Bandera.